Camels are even-toed ungulates belonging to the genus Camelus. They are perhaps best known for their ability to survive in the most inhospitable desert environments. Their ability to retain water and eat almost anything that grows in the desert is legendary. They have also been used widely for a variety of things, such as transportation and called into service as pack animals by both civilian and military personnel. They are also nurtured as a source of milk, meat, leather, and wool. They are a truly amazing testament to one of God's very intricate creations. The English word Camel comes via the Greek κάμηλος, kámēlos from the Arabic جمل, jamal or the Hebrew גמל, gamal, all meaning "camel". A healthy camel, you can tell by the size of its humps. There are two types of camels. The one humped camel called the dromedary camel. The camel with two humps is known as the Bactrian camel. The hump on a camel is made up of fat that is held all together by tissues. This is contrary to the belief of many that camels hold water in their humps.The size of the hump depends on the nutrition of the camel; if there is a lack of food the hump will become smaller. The lips of a camel are thick to allow the camel to eat a wide variety of plant including ones that have thorns. The feet of a camel allow the camel to walk on the sand.The camel can run as fast as 40 mph for short distances, but can have a sustained speed of around 25 mph. Camels come in a wide spectrum of colors ranging from an almost black to a more white color. The hair of a camel is longer on its neck, humps, and shoulders.The camel is about 6 feet tall at the shoulder, and about 7 ft tall at the top of the hump. Camels weigh between 880-1300 lbsThe intestines and kidneys of the camels are especially designed to help water retention. The water gets turned into a thick substance by the kidneys to cut down on the rate in which moister is consumed by the body. The feces comes out almost waterless helping the camel save water. The camel has three stomachs to help aid in the camels harsh diet. The male camels become sexually mature at about the age of 5 years old. The females become sexually mature at around the age of 4 years old. The females are capable of producing offspring for approximately 20 years. These factors are determined by whether they are nomadic or domestic; get plenty of nutrition, and other factors. The rut begins in the wet months of the year, this varies with location. When a potential female mate is contested, the males will go through a series of events to decide who gets the right to mate with the female. The male will make low grunting noises; they will then move their heads in all directions. The two males will then try to make themselves look as tall as possible, and then they fight. They fight by biting at the other camels legs and head.The male will try to squat on the female, most of the time the female will run away. When the female runs, the male will follow her biting at her trying to get her to stop. Once the female gives up and stops the male will then proceed to mate.The pregnancy last about 13 months, the camel gives birth to a calve. The calve is weaned at about 1 1/2-2 year of age. 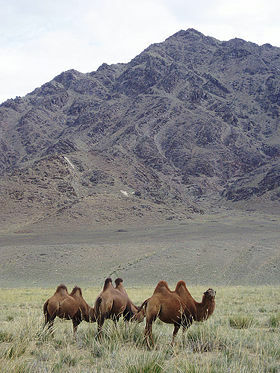 Camels are native to the desert area between eastern and western Asia. There is an estimated 17 million camels world wide.However, they have been transported to all over the world. They are becoming a problem in Australia where they were brought over to serve as transportation in Western Australia in the 1800's and early 1900's. However, now they have become nomadic, and eat many of the scarce resources needed by the sheep that are raised as livestock. Their numbers are estimated at 700,000. They have become so much of a problem; the Australian Government hires people to kill the camels. Until the early 1900's there were a few surviving camels in the southwestern United States, surviving ancestors of those brought over from Turkey to serve in the United States Camel Corps. 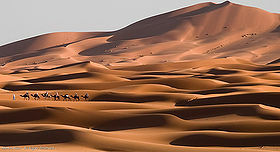 Camels are herbivores, they will eat almost any shrub, tree, and even cacti in the desert. Camels spend 8-12 hours a day eating shrubs. Camels have been domesticated for over 3000 years. Throughout Asia they were for their meat, milk, and were used as pack animals. 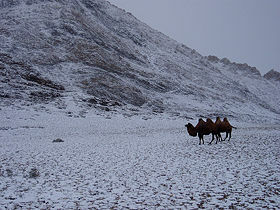 Nomadic tribes today still use camels for their milk. Camel milk is much richer in fat and has more protein than that of a dairy cow. In India the milk is sold for medical purposes. 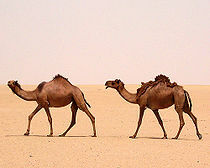 Camel meat is still eaten in many arid areas of Asia and the Middle East. Humans also get wool and leather from the camel. Even the manure is used as fuel for fires. Camels have even been used for military purposes. Throughout Asia militaries used camels are there Calvary livestock. Even for a brief time in the U.S. Army we used camels. In the 1850's, the United States Army started the United States Camel Corps. The camels were used to help fight the Indians in the arid parts of the Southwestern United States. After the Civil War however, the Camel Corps was all but forgotten. The camels were sold of to private owners and the Camel Corps was disbanded. isrvma.com Yagil R. ISRAEL JOURNAL OF VETERINARY MEDICINE. Animal Diversity Web Robert Naumann. University of Michigan Museum of Zoology. reproduction-online.com M Abdel-Raouf, MR El-Bab, and MM Owaida d. Society for Reproduction and Fertility. This page was last modified on 5 December 2014, at 17:28.